Reliable adapters from telescopes to cameras are built from end to end assemblies (trains) of cylindrical adapters and auxiliary lenses screwed together so that they will maintain focus and not slip or flex. A typical adapter train for prime focus imaging is shown below. 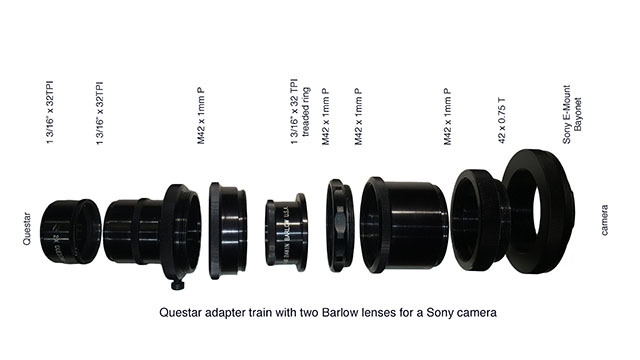 It includes the Questar swivel adapter, a 42mm P to T thread adapter, and a T-ring adapter to a Sony E-mount bayonet. The use of Barlow lenses or eyepiece projection requires additional components. In the simplest case with camera lens mounts supported by Questar, just two parts are required: a swivel adapter that screws into the rear axial port of the Questar and an adapter from the swivel to the specific lens mount used by your Questar supported camera. If you use a camera not supported by Questar or wish to add additional lenses in your optical path, things get more complicated. This page is a reference listing most of the screw standards that you may encounter. These often have multiple similar names. a adapter that screws into the optical port at the back of the telescope. This rear of this part is usually a larger diameter threaded adapter suitable for attaching an adapter that will fit your camera's lens mount. a optional swivel that allows the camera to be rotated to the best position for framing your image. Questar's axial port adapter has this function as do some T2 style camera bayonet adapters. an adapter to fit your camera's lens mount. Standards for connecting optical parts have evolved during the long life of the Questar. These are often very similar and parts can be damaged if slightly different but incompatible threaded parts are screwed together. As a result it isn't unusual to have to include parts who have no optical purpose, only adapting different thread standards. original Questar axial port thread - Prior to the 1964 wide field modification the axial port used the same threading as the top eyepiece port where the diopter adapter is screwed in. This is a 0.925" x 32 TPI thread. The female thread in the Questar control box mates with a male thread on an adapter. Note that the Questar price list I have describes the "#19304 Swivel Coupling Adapter (for older Questars with .950 Ø axial hole)". This is probably an error and should read ".925 Ø axial hole", check with Questar before ordering. modern Questar wide field adapted axial port thread - To take advantage of the full Questar FOV this is required and found all Questars manufactured after 1964. This is a 1 3/16" x 32 TPI thread. Older Questars may have had this modification made. This is also the thread used by Questar/Brandon eyepiece color filters, Barlow lenses, and focal reducers. The female thread in the Questar control box mates with a male thread on an adapter or axillary lens. filter thread for 1.25" eyepieces - This 1.125" x 42 TPI or M28.5 x 0.6 mm tread is used for color filters that screw into common (not Questar/Brandon) eyepieces and also for some Barlow lenses and focal reducers designed to screw onto a standard 1.25" eyepiece. The male thread on the filter mates with a female thread in the eyepiece barrel. 42mm Questar P thread - used for Questar brand extension tubes and camera adapters. This is a M42 x 1 mm metric thread introduced by Zeiss in 1949. The Praktica used it for lens mounts in the 1950s, hence the "P" thread. It is also commonly known as an M42 thread. Female thread end is towards the telescope. 42mm T-mount thread - introduced as the Universal T-mount for camera lenses in 1962 by Tamron. This is a M42 x 0.75 mm metric thread. It is commonly used for many telescope optical chain components like extension tubes and a-focal eyepiece adapters. So called T-ring camera bayonet lens mount adapters are common and inexpensive. A T2 mount has the same threading as a T-mount, but can be rotated via three set screws to align the camera and lens. Female thread end is towards the telescope. Other threaded adapters are common for small sensor video cameras. These include C-mount 1" x 32 TPI for video cameras and M12 x 0.5 mm for webcams.